Why use noncontact infrared thermometers? Noncontact infrared (IR) thermometers use infrared technology to quickly and conveniently measure the surface temperature of objects. They provide fast temperature readings without physically touching the object. You simply aim, pull the trigger and read the temperature on the LCD display. Lightweight, compact, and easy-to-use, IR thermometers can safely measure hot, hazardous, or hard-to-reach surfaces without contaminating or damaging the object. Also, infrared thermometers can provide several readings per second, as compared to contact methods where each measurement can take several minutes. IR thermometers capture the invisible infrared energy naturally emitted from all objects. Infrared radiation is part of the electromagnetic spectrum which includes radio waves, microwaves, visible light, ultraviolet, gamma, and X-rays. This infrared "invisible heat" of an object is transferred in three ways: Reflected, Transmitted, and Emitted. Reflected energy is not particularly related to the temperature of the target object, and transmitted heat is related to the both the internal temperature of the target object and the temperature of the "transmitted to" object. The only type of energy that can be used to tell that actual surface temperature of the object is Emitted energy. When IR thermometers are used to measure surface temperature they can potentially sense all three kinds of energy, therefore all thermometers have to be adjusted to read Emitted energy only. Measuring errors are often caused by IR energy being reflected by light sources. Some IR thermometers allow you to change the emissivity in the unit. The value of emissivity for various materials can be looked up in published emissivity table. Other units have a fixed, pre-set emissivity of 0.95, which is the emissivity value for most organic materials and painted or oxidized surfaces. If you are using a thermometer with a fixed emissivity to measure the surface temperature of a shiny object you can compensate by covering the surface to be measured with masking tape or flat black paint. Allow time for the tape or paint to reach the same temperature as the material underneath. Measure the temperature of the taped or painted surface. That is the true temperature. When measuring shiny surfaces, such as aluminum and stainless steel, the reflectivity of the surface will skew the reading of an IR thermometer unless you accommodate for it. Either coat surfaces such as griddles or cooking pans with a non-stick cooking spray before you take your reading, or place a small piece of masking tape on the metal surface and measure the taped area. An IR thermometer can go from kitchen to cold storage (above freezing) and still provide an accurate reading if given time to acclimate to the new ambient temperature. It's best to leave the unit where it will be used most often. Note: If the unit is left in an environment below freezing, it will temporarily fail to operate properly. Use an IR thermometer to read internal temperatures of liquids, such as soups or sauces, simply by stirring the liquid and then reading the surface temperature. Keep the thermometer away from steam to avoid condensation on the lens, which will skew your reading. 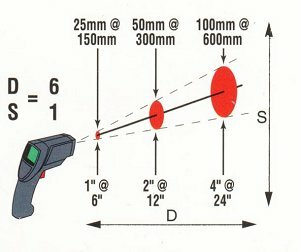 Make sure that the target is larger than the spot size the unit is measuring. The smaller the target, the closer you should be to it. When accuracy is critical make sure that the target is at least twice as large as the spot size. The optical system of an infrared thermometer collects the infrared energy from a circular measurement spot and focuses it on the detector. 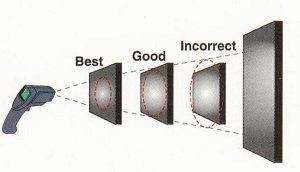 Optical resolution is defined by the ratio of the distance from instrument to the object compared to the size of the spot being measured (D:S ratio). The larger the ratio number the better the instrument's resolution, and the smaller the the spot size that can be measured. The laser sighting included in some instruments only helps to aim at the measured spot. Quality assurance begins at the receiving dock. When a delivery of fresh or frozen food arrives, use your Global Sensors IR thermometer to check that the products, shipping crates, and internal temperature of the delivery truck are all at the right temperatures. Once received, verify that frozen and chilled foods are stored at or below 4.4°C to assure freshness and quality. In supermarkets where product may be stacked unevenly or too high in display cases and freezers, check to find warm spots or uneven cooling. Also, you can quickly and frequently monitor proper temperatures of all items stored in walk-ins. Exact temperatures become vital to preventing food-borne illness. To avoid bacteria growth, many foods must be cooked to a specific temperature. An All QA Products thermometer instantly confirms that your surface temperatures are within safe parameters. In order to confirm internal temperatures, you can use All QA Products thermometer that feature an internal probe. Food products that are ready to be served or sold and are located in holding or serving areas must be kept out of the Temperature Danger Zone which is 4.4° to 60°C. Hot Holding Warm prepared foods that are kept in steam tables, warming ovens, and other heated serving and holding areas should be carefully monitored to remain at 60°C or above. You can use your IR thermometer to check the internal temperatures of soups, gravies, and other liquid foods by agitating them before reading. Cooling Improper cooling is the number one cause of food borne illness. After food has been cooked and served, use your All QA Products thermometer to confirm that leftovers are taken down to an appropriate temperature—from above 60 to 21.1°C within two hours, and then down to below 4.4°C within another four hours. Reheating The last important temperature-related checkpoint is reheating. Your IR thermometer can confirm that foods are being reheated to at least 73.9°C to destroy any bacteria caused by improper cooling or storage techniques. You can use your non-contact thermometer to check more than just the temperature of food. You can also evaluate the performance of your equipment and machinery. Detect hot spots or leaks by taking sample spot readings of freezers, walk-in coolers, refrigeration lines, compressor motors, electrical, and HVAC equipment. Safely check the temperature and performance of ovens, ranges, rotisseries, deep fryers and dishwashers. Check clean dishes immediately after washing to ensure that high enough temperature levels were achieved in the dishwasher for sanitation purposes. Many specialty food recipes call for very specific preparation temperatures. For example, sugar used in meringues and icings relaxes to the softball stage at 104°C; at 160°C caramel reaches the stage for flavoring and decorating, and at 177°C it darkens. By using an IR thermometer you can instantly check these tem­peratures and avoid the mess of using a contact thermometer. Experience notwithstanding, it is often difficult to know when cooking surfaces have reached the proper temperatures. For example, a common way to test whether a griddle is "pancake ready" is to see if a drop of water skittles across its surface. But water does this at a wide temperature range—roughly between 160° to 227°C —whereas pancakes griddle best between 177° and 188°C and meat, on the other hand, sears best at about 232°C. By instantly knowing these temperatures you can avoid the guesswork and ensure food is cooked perfectly.